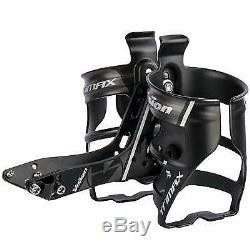 FSA Vision Trimax Rear Hydration system Double Water Bottle Cage Mount Black. FSA Vision Trimax Rear Hydration system Double Water Bottle Cage Mount Modular saddle drink system Fits traditional and snub-nose saddles Multiple mounting and lashing points can be customized Allows various positions to mount cages, CO2 pump, accessory bag, etc. 3-position (40 degrees) saddle rail mounting options 5-position (40 degrees) bottle cage tilt adjustability Precision-made alloy frame with corrosion-resistant hardware Includes Quiver Saddle mount and two High Grip cages Saddle mount - Bead blasted anodized black Neutral graphics. NEGATIVE FEEDBACKS CAN BE AVOIDED FOR BOTH PARTIES. ALL ITEMS MUST BE NEW UNUSED AND MUST BE IN THE ORIGINAL PACKAGING YOUR PRODUCT CAME WITH. WE WILL ANSWER ALL EMAILS AS QUICKLY AS POSSIBLE. The item "FSA Vision Trimax Rear Hydration system Double Water Bottle Cage Mount Black" is in sale since Monday, December 25, 2017. This item is in the category "Sporting Goods\Cycling\Bicycle Accessories\Water Bottles & Cages". The seller is "bikesallday110" and is located in Gardena, California. This item can be shipped to United States, Canada.